Air pollution cast a grey haze over the city yesterday. It is best if you do not go outdoors. If you need to, try not to breathe. 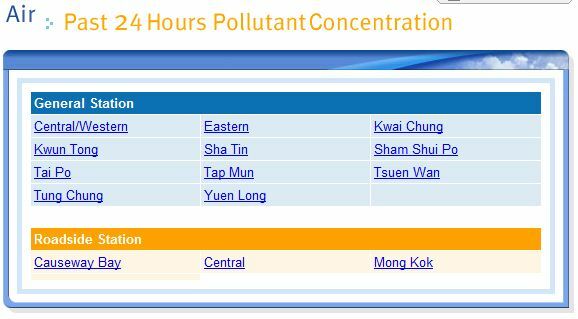 Record levels of air pollution were recorded yesterday in Hong Kong. We’re also in the middle of a long, strong heat wave. 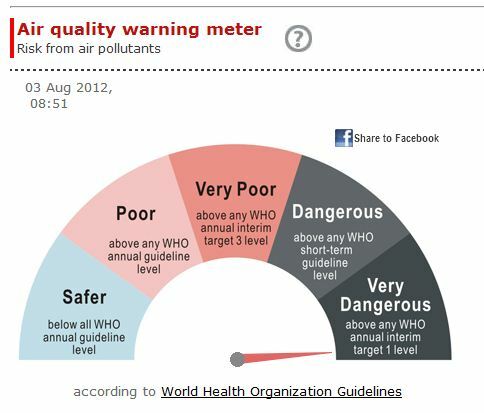 And while the Hong Kong Observatory has a world-best public advisory system in place, the Hong Kong Environmental Protection Department is failing the citizens of Hong Kong. Air pollution is at record levels and public health is at jeopardy, yet there is little done to provide timely updates and information. That 182 record from 2003 falls into the category of ‘Very High’ (EPD: What does the API tell us?). 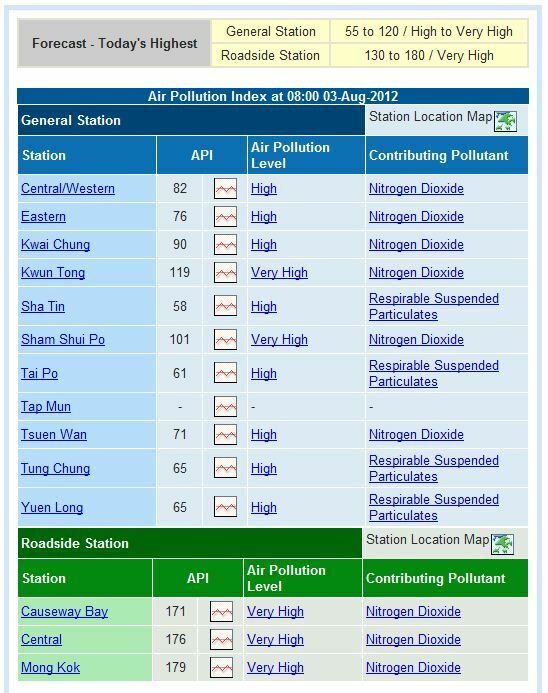 Then in 2011 the API crept higher and higher in February and May. Always the numbers were in the ‘Very High’ category. And then there was yesterday. For the first time in over a decade, Hong Kong recorded API above 200 – rated as the ‘Severe’ category. 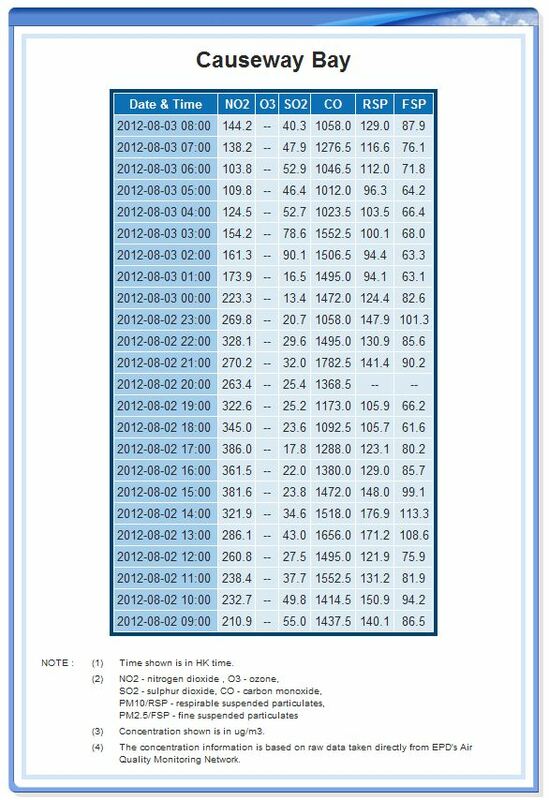 In Central air pollution registered 212 on the API. Yet for the general public, there remains little easy data to access – and no public advice system. The Environmental Protection Department does a deplorable job at presenting the data (see detailed explanation below). In direct contrast, the Hong Kong Observatory is a well-oiled machine. The public advisory system has become institutionalised across the country. Typhoon Warning signals are publicly displayed on roadside signs and in office building lobbies. Those with an iPhone can download the HKO App. At 06:45 this morning my phone flashed the latest advisory – Very Hot Weather Warning (temperatures above 33 degrees Celsius). People with existing heart or respiratory illnesses (such as coronary heart disease and other cardiovascular diseases, asthma and chronic obstructive airways diseases including chronic bronchitis and emphysema) may experience significant aggravation of their symptoms. There may be also widespread symptoms in the general public. These include eye irritation, shortness of breath, coughing, phlegm and sore throat. The Hong Kong Environmental Protection Department is failing to provide timely, understandable information to the people of Hong Kong. Some of these numbers look quite high. Yet there is no explanation, no information, no education. Is an NO2 reading of 328.1 at 2012-08-02 22:00 bad? Or is a CO reading of 1656.0 at 2012-08-02 more of an issue? The Environmental Protection Department is creating a detailed log for scientists and researchers.